The original Canon PowerShot G9 X is one of our favorite compact point and shoot cameras, and at CES 2017 Canon is unveiling a Mark II version with a new Digic 7 image processor. The new processing engine enables improved tracking, with facial recognition as well as tracking of other subjects. Additionally, the camera can also now detect and adjust the exposure while you’re shooting a video. Users can also expect to have a bit more buffer for shooting images in quick succession. The Digic 7 engine bumps up the maximum burst rate to 8.1fps JPEG, and 8.2fps in raw, from the G9 X's 6fps. The new Digic 7 engine also brings new timelapse capabilities, including three scene modes for capturing movement, changing light and your typical set interval. USB charging is another welcome addition. 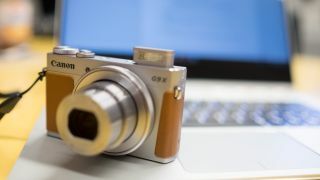 Elsewhere the G9 X Mark II is largely the same as its predecessor, with the same 1-inch 20.2MP sensor, a 3.5x zoom lens for a 35mm-equivalent focal range of 28-85mm, a three-inch LCD touchscreen, and NFC and Wi-Fi connectivity. The Canon PowerShot G9 XII will roll out later this February for $529 / £449.99 (about AU$740). On a side note, Canon is also introducing a new PowerShot G7 X Mark II Video Creator Kit that comes with a SanDisk 32GB SD Card, Manfrotto PIXI Mini Tripod and additional NB-13L battery for $749 (about £610, AU$1,040).